As the name implies, the Daytripper pass gives you unlimited travel (until 4am the following day) on all regular Sydney busses, ferry and suburban trains. It also allows for entry or exit at Airport Line stations (is this equivalent to the airport link?). This is a good deal if you plan on using the public transit system extensively in one day. The Family fare deal also applies to the DayTripper. When at least one fare paying adult travels with their children or grandchildren, the first child travels for a child fare and the other children travel free. The Daytripper pass costs AU$15.40 for adults, and AU$7.70 for children (above 4 years old, less than 16). More information about the Daytripper can be found here. The Sydney Pass works similarly to that of the Daytripper, except it can also be used on the Sydney Explorer and Bondi Explorer buses, has return Aiport Link tickets. It also qualifies you for a discount on select attractions. Sydney Pass tickets are available for 3-days, 5-days and 7-days validity. Tickets starts at AU$110.00 for adults, AU$55.00 for kids, AU$275.00 for families (2 adults, 2 kids under 16. Children less than 4 years travel for free). You can read more about the Sydney Pass here. The Travel Pass come in different variations so you can pick one that would suit your needs. There are passes that are valid for busses only, busses & ferry only, and one that lets you ride all 3 services. The colors of the Travel Pass also vary depending on the zones and available services. 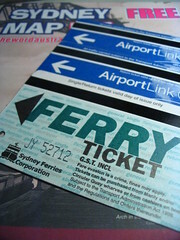 For example, the Red Travel Pass can be used on busses, trains in the red zone and all ferries, except the Manly ferry. The Green Travel Pass works similarly to the Red Travel Pass, but it has access to train stations in the green network and can be used on the Manly ferry (but not the Manly Jetcat). The Travel Pass is available in weekly, quarterly or yearly tickets. Bus only and bus & ferry tickets start at AU$31, while bus, ferry & train tickets start at AU$33. The Travel Pass does not have access to the Airport stations. However, when you buy your travel pass, you can ask to have return Airport Link access for an additional fee. I availed of the Green Travel Pass when I was in Sydney. With the extra return Airport Link tickets, I paid AU$68 for my travel pass. To know which Travel Pass you need, click here. The three kinds of travel pass I listed here is just some of the ticket options available. To know about the other available options, head on to the 131500 Transport Infoline website.